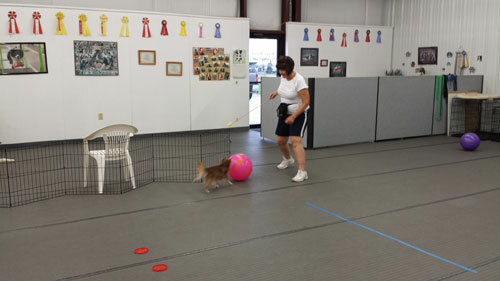 Pat's favorite memories from 2014 at Happy Hounds!! In November I had a chance to attend a fantastic seminar at the Houston ZOO! 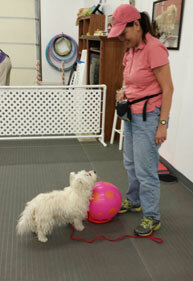 The speaker was one of my favorite trainers in the world - Kathy Sdao! 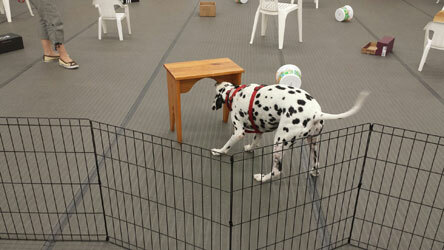 Not only did we learn new ideas about dog training, but we also were able to watch the zoo keepers work with some of the animals. 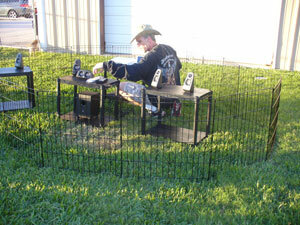 It is truly amazing what they can get the animals to do voluntarily now (that they used to have to tranquilize them for). One thing that totally blew my mind is that they had taught a female orangutan to pee in a very small plastic cup (on cue) and then she carefully placed it on the floor (outside of her cage) without spilling a drop - WOW! 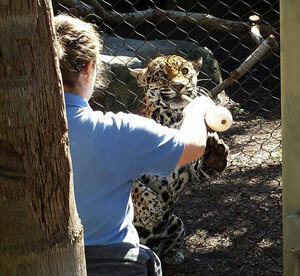 The Jaguars were also pretty amazing - they are target trained (just like we do with our dogs)! 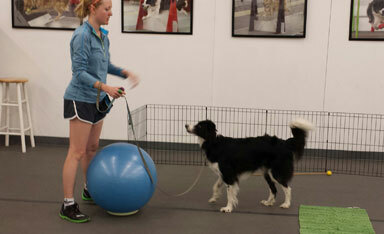 Gave me a lot of neat ideas for training! In October I was thrilled to bring Julie Flanery, the founder of Rally Freestyle Elements, here to teach a weekend workshop and introduce us to this new sport! She provided us with tons of information and made it so much FUN! 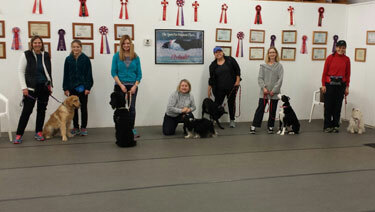 Not only did we learn all the basics of the sport, we also had many opportunities to practice the moves with our dogs over the course of the weekend. I've added this class to the schedule for 2015! 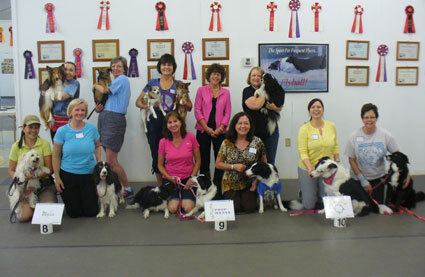 Again this year we've had lots of great classes filled with fun people and dogs! 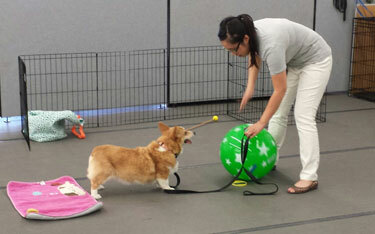 I introduced Treibball classes this year - woo hoo! 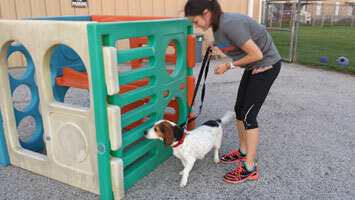 Pat's favorite memories from 2013 at Happy Hounds!! 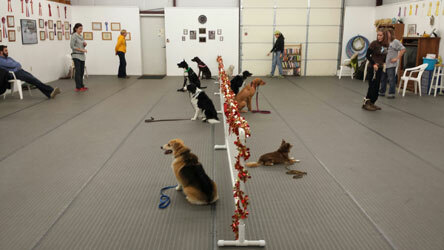 Every year we all look forward to our annual Christmas Party! 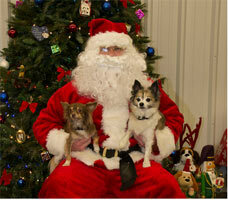 Our students are invited to bring their dogs and enjoy some games, food and pictures with Santa! As always, we had a blast! 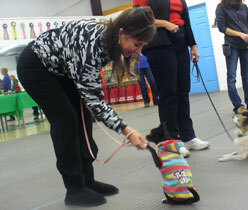 Check out the pictures and videos to see some of the things we do at the party! Remember those wonderful drive in movies we all went to as kids (okay, maybe my age is showing :). One of the best things was getting to play on the playground before the movie started! 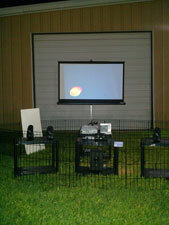 Last November we had our first Drive In Movie Night at Happy Hounds!! 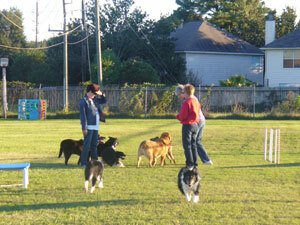 Lots of people and dogs getting to hang out and have fun. 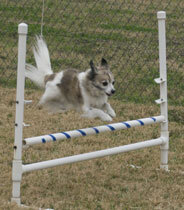 The dogs enjoyed running and playing in the field while Anthony set up the movie (thanks Anthony!!!). Then it was PIZZA time! After running and playing the dogs were happy to lie down and rest while we watched the movie. We'll be doing this again so please check our FB page for the next date and time! Bringing new things to our school and to Houston is always one of my goals! 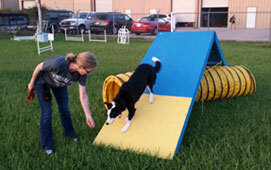 When I heard about Treibball (a herding game for our urban dogs) I knew this is something many of my students would love! I couldn't find anyone in the Houston area that was teaching it so I started looking for a workshop where I could learn the game. Well, I found one - in Tucson, AZ! 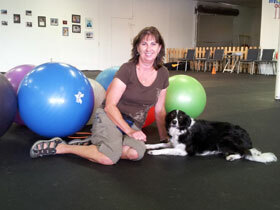 Star and I loaded up and drove to Tucson for a two day workshop given by the president of the American Treibball Association, http://www.americantreibballassociation.org/ WHAT fun we had! Give me a call to find out how you can get started in this new sport! 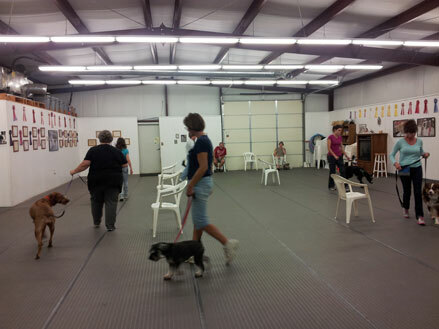 A few years ago I attended a workshop at Service Dogs, Inc. http://www.servicedogs.org/ (an organization that trains shelter dogs to become service dogs!). 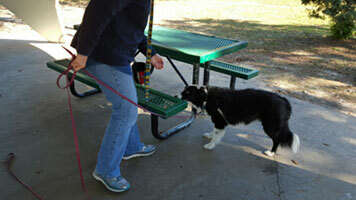 There I learned the basics of teaching service dog tasks. 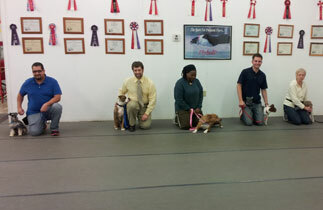 After that workshop, I began teaching Helping Paws (classes that teach dogs to ‘help’ around the house). Over the years, I've received many requests from people with disabilities seeking to have their dog trained to assist them at home. 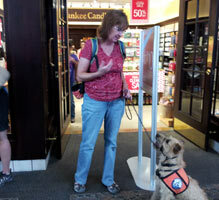 Unfortunately, most service dog schools can't train someone's personal dog for them. 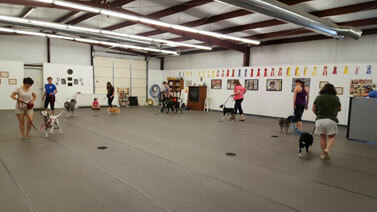 However, Service Dogs, Inc. recognized this need and last June they offered their first five day training school to teach trainers how to train service dogs for people! I jumped at the chance to do this! 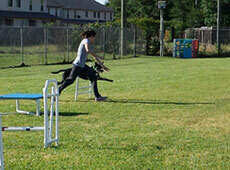 We spent the week working with service dogs-in-training. 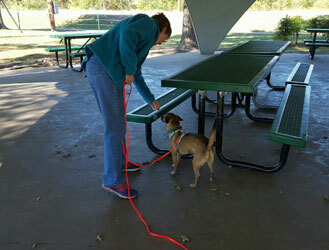 I learned how to teach them to do many of the things that an individual with disabilities might need their dog to do to help them be more independent. 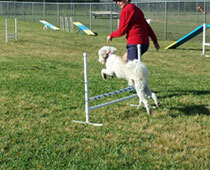 Please check back for information on future programs that will be offered at Happy Hounds! 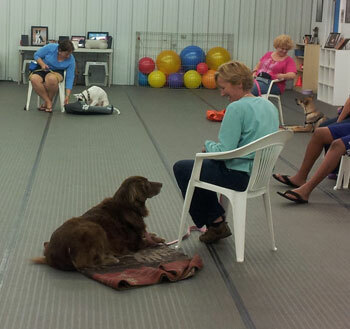 Our classes are so much fun and it's always great to see our students (human and dog :) enjoy learning new things! 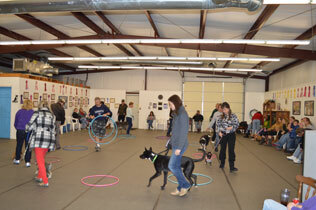 Here are a few pictures of classes from 2013!